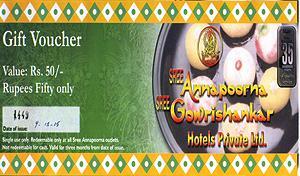 Send a Gift of Lunch Coupons or Dinner Coupons from Annalakshmi. Send a Gift of Lunch Coupons or Dinner Coupons from The Residency. 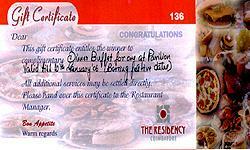 Send a Gift of Lunch Coupons or Dinner Coupons from The Residency Towers - Chennai. 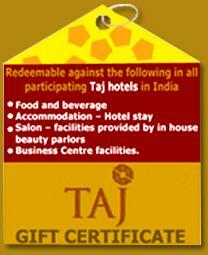 Send Food, beverage and Accommodation Gift Voucher from Taj Hotel.